God of War has finally made it to the PSP. And as it turns out, it's exactly what you think...God of War on the PSP. And yes, it's pretty damn cool. This fits in before the original God of War on the PS2 in terms of storyline, back when Kratos was still taking orders. The sun falls out of the sky after the first "level" of sorts and everything goes downhill from there. The storyline is well told through masterful voice acting and direction on the movie scenes. While some of the gods come across as a little flat, I think that was the intention, as they're gods, and don't really have an interest in what's happening. This game leads directly into the beginning of the PS2 one, so we already know where it ends, but Kratos definately goes through his fair share of hardship along the way and really sets the stage for his betrayal. The storyline might not be as powerful if it weren't for the graphics, which are mindblowing. The fact that the PSP can pump out graphics nearly as powerful as the PS2 is nothing short of astonishing. The acting on the faces is very believable and the landscapes and more epic villians you'll come across are beautifully rendered. Animations are top notch and everything flows together very well. The only real problem is the camera can get in odd spots sometimes and you lose site of people off screen. Thankfully most stop fighting when they get off screen, but when those others don't, it can be frustrating. Gameplay is pretty much perfect. With the abscence of a second joystick, evading is done by hitting both L and R while moving in a direction. It takes about 10-15mins of using it to get used to the idea of it, but after that, I almost prefer this control scheme to using the right stick. Attacking and defending is the same as before and just as fun. The variety of bad dudes you face is pretty good, but towards the end, there is a lot of the same dude and can get kind of tiring. Now, mechanically and graphically, the game is great, but it's quite short. My game clock said about 5 hours. I had read previously that it would take 7, so I guess I'm just awesome. Even so, this is a relatively short game. After you finish the main story, there are challenges and a harder difficulty unlocked, but if that's not your thing, this might not be worth a full purchase. 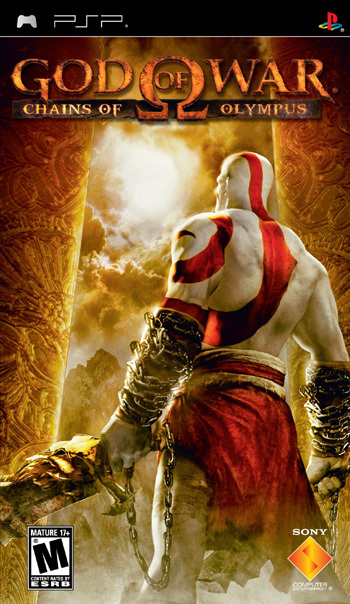 But if you love God of War and want some great action on the go, God of War: Chains of Olympus is for you.